Meet author Thrity Umrigar, whose latest book is The Story Hour. Thrity Umrigar, author of The Story Hour (Harper, August 2014) will be the featured guest at a benefit for the CH-UH Public Library on Sunday, September 7th from 4-7 p.m. at the Wine Spot, 2271 Lee Rd. in Cleveland Heights. In The Story Hour, Thrity has delivered another brilliant look at love and friendship. What happens when an experienced psychologist abandons protocol to befriend a lonely patient? Thrity Umrigar is the author of five novels--The World We Found, The Weight of Heaven, The Space Between Us, If Today Be Sweet, and Bombay Time--and the memoir First Darling of the Morning. An award-winning journalist, she has been a contributor to the Washington Post, the Boston Globe, and the Huffington Post among other publications. She is the winner of the Nieman Fellowship to Harvard, the 2009 Cleveland Arts Prize, and the Seth Rosenberg Prize. A professor of English at Case Western Reserve University, she lives in Cleveland Heights. Join us for a reading group discussion of The World We Found by Thrity Umrigar! The acclaimed author of The Space Between Us and The Weight of Heaven returns with a skillfully wrought, emotionally resonant story of four women and the indelible friendship they share. Indies First is a national grassroots movement started by Sherman Alexie to encourage authors to support their local independent bookstores on Saturday, November 30th. Participating writers will visit bookstores to recommend their favorite reads to customers. The Saturday after Thanksgiving has become known as Small Business Saturday because of a very successful effort by American Express to urge shoppers to visit small independent retailers Thanksgiving weekend. Several authors will be at Mac's throughout the day on November 30th. Below is the evolving schedule; stop in to say hi, check out these author's works and hear what they like to read. 4-5 p.m. Gail Bellamy, author of Cleveland Summertime Memories, Cleveland Christmas Memories and Cleveland Food Memories. Description: Please join us for our monthly discussion. This group meets on the second Thursday of each month at the Gardner Library. Everyone welcome! Please call (913) 826-4600 for more information. Description: Everyone is welcome to join us to discuss the books the members have chosen to read. Please read the scheduled book before the meeting so that you can join in our discussion. We meet on the fourth Wednesday of the month at 6:30 PM in the auditorium of the Preston Royal Library in association with the Hillcrest Forest Neighborhood Association. The book for October is The Space Between Us by Thrity Umrigar. Visit the Hillcrest Forest Neighborhood Association Website at hillcrestforest.org for more information about the book club contract the Preston Royal Library at 214-670-7128. Thrity Umrigar reads from The Weight of Heaven, The Space Between Us. Thrity Umrigar reads from The Weight of Heaven. 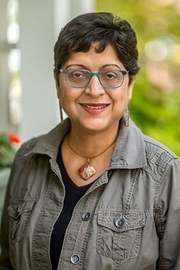 Thrity Umrigar is currently considered a "single author." If one or more works are by a distinct, homonymous authors, go ahead and split the author. Thrity Umrigar is composed of 8 names. You can examine and separate out names.